The price of gold has gone on a tear this summer, from slightly under $1500 per ounce to well over $1800 per ounce, and it looks like it wants to go higher. What gives? Well, if you bought gold last spring, you’re looking pretty smart. And if you bought gold a decade ago at $300 per ounce, you’re looking like a whiz. Imagine buying a stock 10 years ago, having it appreciate fairly steadily over the decade, and then watching its price increase in less than two months by more than your original purchase price. For a commodity to increase at such a rate is truly extraordinary, even portentous. For an investor, gold is an insurance policy, a way to preserve some purchasing power regardless of what happens to the official currency or a country’s banking system. For a society, the rising price of gold is not a good thing. When investors flock to gold, it means they are not investing in wealth-creating enterprises. 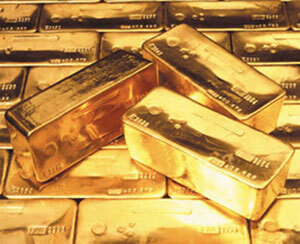 Money (which is what gold is once again becoming) is the oil that enables a country’s economic engine to run smoothly. Gold can’t make our country wealthier any more than engine oil by itself will get you from point A to point B, so while owning some gold may be individually prudent, it won’t make our country more prosperous. Gold is a barometer that warns of financial and political storms. When its price goes up, as much as it has this summer, it is telling us that our country is in deep, deep trouble. “Gold’s meteoric rise” is just another way of saying “the dollar’s sickening plunge.” Because the dollar is our normal frame of reference, we think more in terms of the price of gold rising than the value of our currency falling. Gold provides a mirror image to the dollar, and the golden mirror is telling us that the Federal Reserve Note is critically ill.
Actually, the dollar has been sick for a long time. Forty years ago this month, President Richard Nixon “closed the gold window”—that is, the United States defaulted—yes, “defaulted.” Nixon broke our country’s solemn promise to redeem our foreign trading partners’ paper dollars for gold. There had been another default in 1933 when President Roosevelt “closed the gold window” domestically by refusing to let Americans exchange paper dollars for gold (Americans were free to own gold again without restrictions in 1975). Indeed, FDR even made it illegal for Americans to own gold, just as the Soviet communists forbad Russians to have dollars. But August 15, 1971 was the day that the dollar’s last link to gold was severed. Nixon’s decision to default began the slow death process that is the inevitable fate of fiat currencies. It also means that we have been engaged in a partial default on our debts for the last 40 years, for we have been repaying our debts with Federal Reserve Notes that have less purchasing power than what we borrowed. The dollar has now begun its death throes. (Don’t panic, the process could take years.) The perception of increased likelihood of U.S. default by monetary debasement, triggered by the pathetically ineffectual debt-ceiling agreement earlier this month, has shaken the confidence of millions, if not billions, of people in Federal Reserve Notes. People just don’t believe that our government will get spending under control. They have doubts about the paper Federal Reserve Note and, by extension, the “faith and credit” of the government whose creditworthiness undergirds the Federal Reserve Note for better or for worse. Some may argue that gold is irrelevant and that the dollar really hasn’t taken a hit because its exchange value against a basket of foreign currencies has remained fairly steady this summer. This is hardly reassuring. The currencies from smaller-GDP countries don’t compete with the dollar. What is your average American or European going to do with South Korean won or Mexican pesos? The only two currencies that compete with U.S. dollars are the euro and the Japanese yen. Europe is a mess, suffering multiple sovereign-debt crises. The E.U. is on life-support and the euro could implode, yet the dollar can’t rise against it. This is a sign of incredible dollar weakness, not strength. The yen has been the strongest of the three, which is astounding, since Japan has a debt-to-GDP ratio more than twice as high as ours and has been devastated by March’s massive natural/nuclear disaster. If Japan, with its massive economic problems, is deemed the strongest major currency in the world, then the world’s fiat currencies are a joke, and it is no wonder that the price of gold is setting new record highs. Buckle up, folks. Things are getting very interesting, and it isn’t going to be fun.